Paradiski covers an extensive ski area incorporating La Plagne and Les Arcs. The contrast between pretty tree-lined runs and high altitude glaciers is what makes this area particularly attractive, as well as the area offering a fantastic choice of slopes for all abilities. Access between these two resorts is made easy by an express gondola allowing visitors to reach the neighbouring resort within just a few minutes. The result is a wide array of pistes to choose from, plus plenty of activities right on the doorstep. Both Les Arcs and La Plagne are situated over different levels and this attracts families and beginners who can enjoy some gentle slopes near the villages while the more adventurous skiers can head up to the glaciers. Les Arcs can be divided into five separate resorts at different levels and access between these altitudes is quick and easy. The traditional village of Vallandry is at the lowest level and has a distinctly French feel, whilst Arc 1800 and Arc 1600 are the most central areas with an extensive range of bars and restaurants. Arc 1950 is a purpose-built resort and Arc 2000 sits at the highest altitude. Similarly to Les Arcs, La Plagne is also set over different levels. The main area is Plagne Central with a good range of amenities. Families tend to choose Plagne 1800 due to a good range of childcare facilities. Above 1800 there are three further villages offering ski in- ski out access. So, how does look at how Paradiski looks on paper? Overall there are 435km of pistes, 225km in La Plagne and 210km in Les Arcs. Broken down, the runs include 140 easy, 65 intermediate and 37 difficult. There are a total of three snowboard parks, 60km of cross country ski and the longest run stands at 7km. As a large proportion of the Paradiski area is located over 2000m, the snow is fairly reliable. The area boasts 417 snow cannons so even at lower levels there should never be any shortage of powder. The season generally runs from mid-December to April. There are blue runs at all levels in both resorts and so novices have a good choice of terrain to choose from. There are also English speaking ski instructors in resort. The multitude of interlinked blue and red runs makes this area something of a ski paradise for those with intermediate abilities. The scenery is varied with plenty pretty tree-lined descents and fabulous skiing on the Glacier de Bellecote. Keen to take on a challenge? The area is home to Europe's biggest vertical of 2000m. 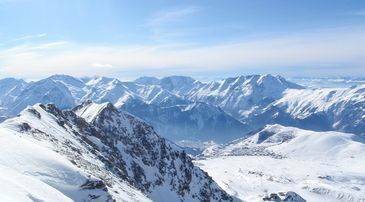 Expert skiers can also enjoy the breathtaking 7km Aiguille Rouge in Les Arcs. In Les Arcs, snowboarders will enjoy the funpark located above Arc1600 complete with boarder-cross, half pipe, kicker, rails/slides and superpipe. In La Plagne, there is both a beginners' park and expert park including boarder-cross pipes and two half pipes. Cross country skiers will not be short of terrain with an entire area between Les Arcs and La Plagne dedicated to cross country skiing. 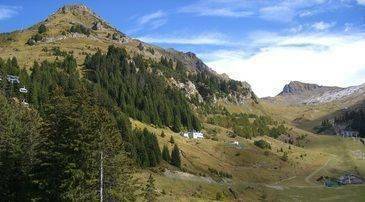 The trails are located on the border of the Vanoise National park. Additionally, there is a high altitude route above Arc 1800. Accessing the slopes is not difficult with a total of 52 ski lifts. Almost all the runs from Les Arcs are accessible by chair lifts or gondola. This also makes the access to blue runs easier for beginners. Connection slopes mainly feature tow ropes. In La Plagne most of the lifts are high speed and modern. The ski season in Paradiski tends to run from mid-December to late April. Taking a break from the white stuff you can relax at the cinema, bowling alley, zip-wire or take a dip in the heated outdoor pool. Across all the levels of Les Arcs, visitors will find a good selection of eateries. There are plenty of traditional French specialities to try out along with steakhouses, brasseries and snack bars. It is a very similar picture over in La Plagne. Popular restaurants include traditional mountain restaurants such as Le Petit Chaperon Rouge and La Refuge. Prices look a little something like this: coffee 3 Eu, house wine 13 Eu and pizza 12 Eu. Whether you are looking to party or just relax in a low key bar, the area can cater to your needs. Over in Les Arcs the Red Hot Saloon, located in 1800, plays live music and shows all major sporting events. El Latino Loco is also very popular for an informal atmosphere with drinks. If you really get into your groove and want to dance the night away head over to La Plagne to The Mouth Bar, or Saloon Bar which are both open into the small hours. In the entire Paradiski area, there are a whole range of activities to enjoy both on and off the piste. If you are mainly looking for more action on the snow, you can choose from snowmobiling, tobogganing, snowshoeing, natural outdoor ice skating, and bobsleigh. From 2016, visitors will also be able to enjoy Snowga, the newest fitness craze combining yoga and snow sports! Prices for lift passes really vary depending on the ski area, the time of year, and the duration. There are concession rates for families and senior citizens. As an indication, a family pass for unlimited access to the area costs approximately £227. Lift passes are available for purchase through Madame Vacances before you travel. You can book your ski equipment online with Madame Vacances to take advantage of the best discounts. If you do happen to forget something though, then there are more than 50 ski rental outlets in Les Arcs alone so plenty of opportunity in resort to pick up anything you may need. Les Arcs offers 10 different ski schools and La Plagne has a branch of the French ski school EFS, which often has a number of English speaking instructors. EFS also offers lessons for adults, so no matter where you go everyone will be able to join in the fun. In Les Arcs, families are well catered for. At Millie 8 you will find a new family adventure area with forests, Jacuzzis and plenty of children's play areas. The igloo village should be high on the list of priorities with ice caves, bar and even a dance floor. Depending on the age of your children you will benefit from various childcare facilities. There are private nanny services available for those children between the ages of six months to eight years, and two other clubs catering for older children. Both clubs combine non-skiing childcare with the opportunity to get out onto the slopes. Over in La Plagne, there are two clubs for childcare, The Pepi Penguin Nursery (six months to four years) and The Whizz Kids (three to 11 years). The clubs also offer evening care should you wish to enjoy a dinner just for two. Access to the area can be difficult due to weather conditions. If you are driving it is advisable to park at a lower level and find a funicular to your resort. If you do drive then be aware that during the ski period snow chains are often a requirement and the local police may check that you have them.